The Swiss law on Collective Investment Schemes (CISA) has been revised and came into effect in March 2013. The objective of this revision was to adapt Swiss law to the upcoming effects of AIFMD in Europe and to set a clear landscape for all activities relating to the fund management business, be it the management companies, the investor landscape or distribution activities relating to these investors. For most of the new rules, transitory periods are in place, with the fast up-coming date of February 28 2015 when any fund distributing into Switzerland needs to be in full compliance with the law. We will here focus on the impact the law has no distribution of foreign funds into Switzerland. Next it is important to know how the Swiss define distribution, or marketing. Distribution has a very restrictive definition, and is considered as “any offer or advertisement for Collective Investment Schemes which is not exclusively addressed to regulated financial intermediaries”, meaning that any reference to a fund be it through a website, a cold call, a monthly distribution list, a meeting, amongst others, will be considered as an act of distribution. For a foreign fund to market into Switzerland, it is therefore key to first identify which categories of investors are targeted. This enables easy determination of what needs to be done to comply with Swiss law. What are the options requirements for different categories of investors? Avoid being subject to regulated distribution or any type of registration – however, only FINMA-regulated financial intermediaries such as banks, fund management companies or insurance companies may be contacted. A fund may rely on reverse solicitation, but is important to understand that this must be genuine reverse solicitation, and some time must be spent on ensuring this is documented properly and remain traceable over extended periods of time. Target retail, non-qualified investors, and the fund needs to be registered with FINMA, allowing for public distribution. This is however a burdensome and costly process. Marketing to qualified investors under the third category, FINMA has taken a two-sided approach. On the one-hand, FINMA leaves the market open for funds of all types, structures and domiciles to enter the market. No qualitative or structural criteria are in place. Ranging from private equity to UCITS, everyone is welcome. For these funds to enter the market however, they need to appoint a Swiss representative, as well as a paying agent that must be a Swiss bank. 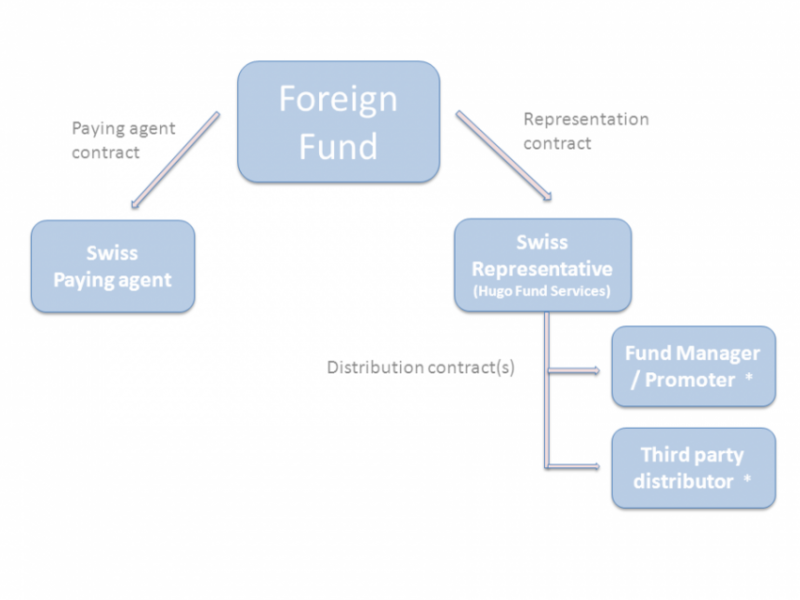 The distribution of the fund needs to be done by an entity that is regulated for distribution either in Switzerland, or in a jurisdiction that is considered equal in quality to Switzerland. To this day we know that European countries and the US are accepted as equivalent by FINMA, but there are questions on other jurisdictions. For alternative investment funds, most often the targeted client base will consist of qualified investors, leading to the need to appoint a representative and paying agent. The Swiss representative will have as one of its main responsibilities to ensure the distribution is done in compliance with the law. From a practical perspective, this does not mean the representative needs to check your client list. Your Rolodex remains yours! Moreover, the Representative will, amongst others, establish legal domicile for the fund in Switzerland, act as a communication channel between investors, FINMA and the Fund, will approve your marketing documentation for compliance with the law and will ensure regulatory oversight for Switzerland. The paying agent needs to be appointed by the fund; however, it is optional for clients to use it. In practice, the paying agent service is rarely used. From a practical perspective, what is the impact on distribution activities once a representative and paying agent has been appointed? Once all is in place, distribution can proceed pretty much in the same way it used to. The representative has all the dealings with FINMA. Attention needs to be placed on ensuring documentation will only be shown to qualified investors, so some suitability works needs to be done, but overall remains quite manageable. The benefit is that any fund is able to distribute in compliance with Swiss law, providing the comfort of operating within a well-defined legal framework, an element highly appreciated by numerous investors as well. Even throughout this transitory period, institutional clients, be it banks, pension funds or family office, are starting to claim the representation service already be in place, giving them, as investors, the assurance of investing in products that operate in a compliant way. What needs to be considered is that thousands of funds will be looking to become compliant before the end of February 2015. Clearly, waiting for the deadline is not a good idea as there will be a tsunami of requests at that time, and most likely a certain number of delays seeing there are a limited number of service providers. The Swiss regulator has offered the market a pragmatic approach to overseeing distribution in Switzerland. FINMA has taken a good look at the investor universe, understood that qualified investors here are used to dealing with funds of different strategies, complexities and investment horizons. They have recognized this and anchored it in the law by not imposing restrictions on funds. FINMA has however shown that distribution is the point of focus, and focuses its supervision on this area. Following a minimal set-up effort, few on-going adjustments to previous marketing habits, and a relatively low cost, business can move forward quite similarly to the previous private placement regime. Great and insightful article Anne-Cathrine. It’s such an important area that a lot of foreign funds struggle with, so putting it in practical terms is really useful and actionable.